Railway Preservation News • View topic - GM train of tomorrow sole surviving dome car status? GM train of tomorrow sole surviving dome car status? Post subject: GM train of tomorrow sole surviving dome car status? What is the current status of the GM train of tomorrow sole surviving dome car? Last I heard the car was out in the desert stripped inside and out. Could the UP possibly acquire and restore this unique car for it's fleet? Post subject: Re: GM train of tomorrow sole surviving dome car status? That would be the former observation-dome car that the railroad later made into a mid-train car. the The Utah State Railroad Museum, one of four museums at the Ogden Union Station obtained the car from a Pocatello, Idaho scrap yard some years ago. Somewhat of a sad story. Can anyone supply more recent information? How difficult would a conversion back to a end of train observation car be? Interesting post...so far...found some more info about this General Motor's "Train Of Tomorrow"
General Motors "Train of Tomorrow"
Union Pacific 9009 "City Of San Francisco"
The words 'prohibitively expensive' come to mind. The car's essentially a skeleton right now (or at least it was a few years ago when I toured it) so yes, converting it back to a round-end car would be expensive, but probably not much more so than a full restoration would be anyway. I got a good laugh on this post. You got me because I was working on the Gainesville Midland (GM) Railroad - a short line in Georgia. They ran Decapods until 1959. 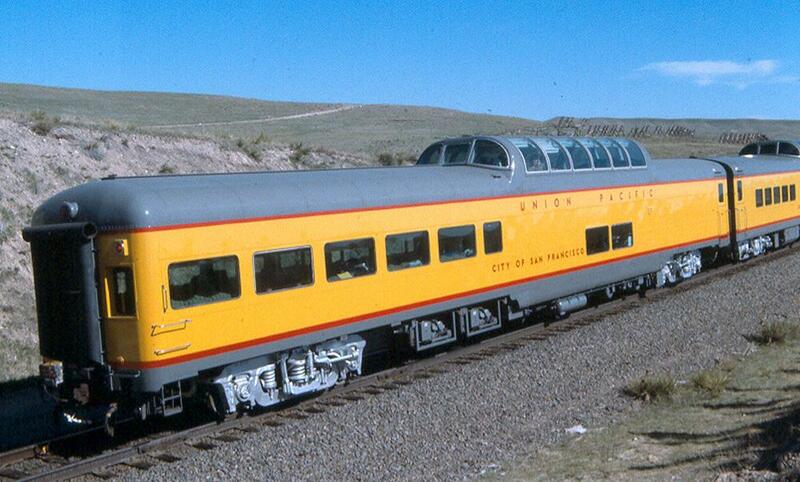 Would we not say the classic California Zephyr, the 1948 20th Century Limted, and other streamliners with their luxury and technological advances (including disc brakes) would be the realization of the Train of Tomorrow in revenue service form? Last edited by J3a-614 on Mon Sep 14, 2015 2:00 am, edited 1 time in total. If you look at historic visions of the future (atomic locomotive or ACE 3000 steam locomotive for instance), one of the most futuristic looking loco was the PRR GG1 with 138 units and 13 were saved (some are not in good condition at the moment). The Train of Tomorrow is unfotunately is sort of in the company with the PRR Duplexes which were forward looking and seemed to compete with their contemporaries but (in the cast of the UP turbines and the PRR duplexes) lost against changes that were outside the railroad industry or the diesel locomotive. Thanks for the links to the GM Train of Tomorrow. If you forget your past, you are doomed to repeat it. Second only to Big boy making a appearance in May 2019. I wish UP was restoring this car as it's just as historically significant as the giant steamer. For the 150th anniversary of the UP Moon glow should deserve it's spot in the spotlight as well. Sadly Moon Glow's current owners have done little to nothing that I am aware of to stabilize and restore this historically significant dome car. I hope someone proves me wrong on this.